When I received this album, there was a note penned onto the invoice, reading something like “Thanks, hope you like the album. –Sam.” At the time I thought it was just a friendly whats-up from the guy who put the popcorn into the package, but soon I realized it was in fact a personal note from the artist, one Osama “Sam” Shalabi. This would have blown my mind if it hadn’t already been blown by the album the guy was thanking me for buying. The CDs themselves (it’s a double LP) have both been destroyed since – spending a year on my friend’s dash and floor pretty much did them in. There were several tracks which, to be completely honest, I never even listened to, having lost the album mere days after buying it. What matters, though, is the title track and the one other which survives in my memory. “On the Bowery” is the last track or late on the second CD, and is a beautiful, organic song led by a female vocalist which lasts for more than ten minutes, fading in and out, and maintaining a lovely, accessible feeling which made it stick in my mind instantly and made it the other track I ripped from the album. The first song I ripped, however, was “Aural Florida” and its intro, “Aural Florida (Approach).” This is a true monster of a song. The intro alone is a full ten minutes of scorching distortion and feedback, rolling and floating you along, propping you up with impossible melodies (impossible because it’s so noisy), until it recedes at last and washes away before the first note in “Aural Florida” – a single plucked string, followed at length by another, and another, and slowly the song builds as Shalabi and his friends pile instrument upon instrument, match keys, swirl around each other, advance, retreat, solo, harmonize, and generally make havoc and beautiful music. It’s amazing, and (so I hear, but don’t hold me to it) mostly improvised. To be honest, I can’t vouch for the rest of the tracks – my friends chided me because they put in one of the CDs I had left in the car and were assaulted by what they described as “tribal singing,” “noises,” and “freaky Devin music” among other things. 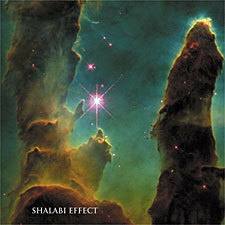 This I cannot deny – it is an established fact that Shalabi is an experimenter as well as a talented songwriter and multi-instrumentalist, and in fact his follow-up to Aural Florida, “The Trial of St. Orange” was far too weird for yours truly. Pink Abyss is another story as you will find, but it has tracks, as does Aural Florida if I am to believe my friends, which are completely off the wall as well. I bought this album for cheap direct from Alien8, the label, and you should too – the songs I have mentioned are well worth the money and experimental tracks be damned! Unfortunately, all three tracks are far, far too long to host here at Robosexual, so you’ll have to make do with this utterly inadequate excerpt. Seems I’ve been doing that a lot lately, why don’t you people make your songs reasonable lengths? Freaks! Here's a few minutes from the middle of Shalabi Effect's "Aural Florida."